Ingredients: Ethyl acetate (solvent), butyl acetate (solvent), cellulose acetate butyrate (a low moisture absorption ingredient that has an extremely high level of impact strength, but it soft and pliable), nitrocellulose (film forming), acetyl tributyl citrate (biodegradable plasticizer – ingredient that increases flexibility within the nail polish, to decrease chipping – without it, polishes are brittle), adipic acid/neopentyl glycol/trimellitic anhydride copolymer (a film-forming and a suspension agent), isopropyl alcohol (solvent), acrylates copolymer (a film-forming agent), PEG-8/SDMI copolymer (a film-forming agent), benzophenone-1 (UVA/UVB absorbers), and etocrylene (UV protector). Now, I can be quite picky when it comes to topcoats. The 3 main things I look for are 1) A short dry time, 2) Maintains my mani (no immediate chipping), and 3) Dries and makes a glass-case-like seal for my nail polish. Let’s see if “Gloss It!” delivered. LOOK. AT. THAT. SHINE. (Natural light). 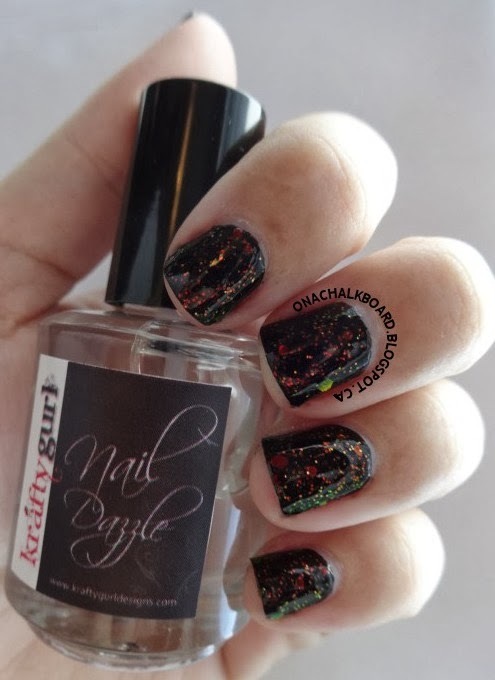 Krafty Gurl’s “Gloss It!” over a black base, with a Kleancolor “Chunky Black Holo” glitter. I think it’s safe to say that I’m officially a fan of this polish. 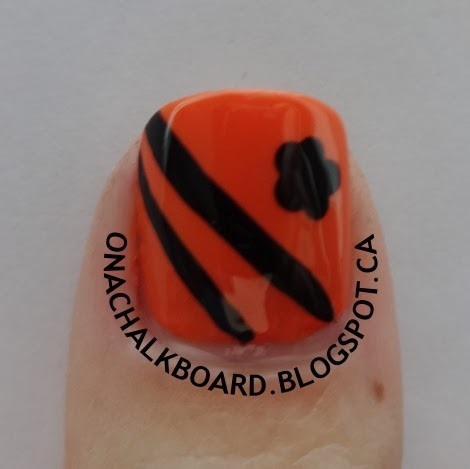 It dried in about 30 seconds, and it maintained my mani, until I took it off, 4 days later. Four days in, and I experienced minimal chipping, just at the ends of the nail. And let me just say, that in order to test the durability of this topcoat, I put my nails through the ringer – baking, crafting, my “real-life-job”, and more, and “Gloss It!” held up like a champ – for the record, the main chip on the index finger was totally my fault (I jammed my finger into a drawer mid-baking, twice, and on the second time, it chipped). In addition to the durability, this topcoat gives what I call a “glass-case-like seal”, which means that once fully dry, it is rock hard, which I looove! 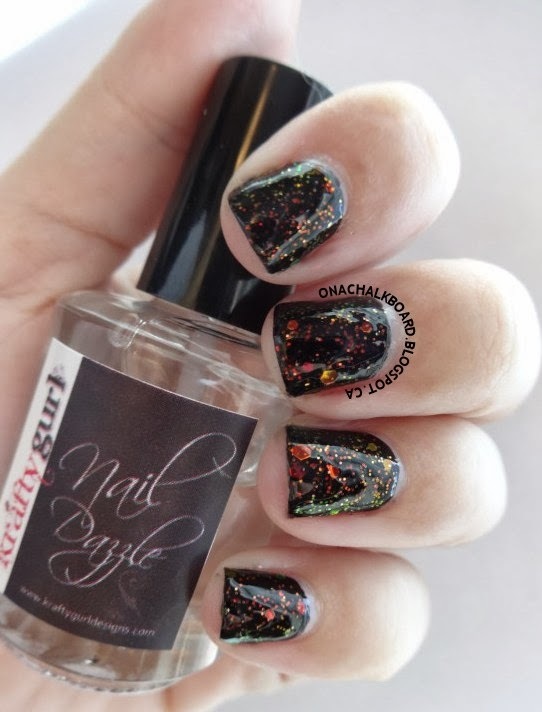 It gives any chunky glitter a strong, firm seal (I always test how strong the seal is by seeing if my nails can make a good ‘clickity-clack’ sound on my keyboard). Application was a breeze, the formula is very thin, but dries to a finish that would make you think that you put on 3 coats. And now for the final test, the streak test! Can this topcoat be put over nail art, which in my experience ALWAYS tends to make the design smudge and run? MINIMAL TO NO STREAKING! Where has this been all my life? 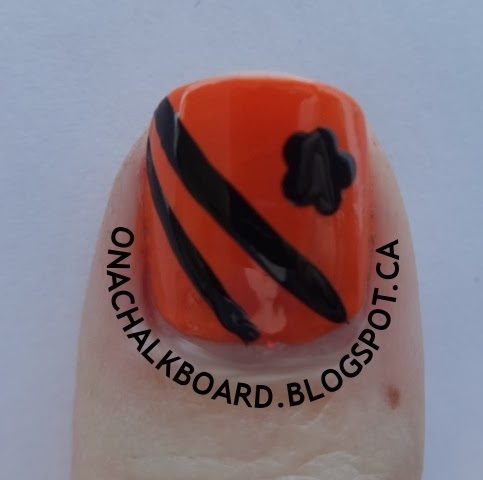 I’m so used to having a great looking nail art design, only to ruin it, by putting on a topcoat that melts all my hard work. Not the case with “Gloss It!” – no streaking (make sure to apply it with a light hand, and minimal strokes, of course). I’m officially a convert! No more cheap drug-store topcoats, I think I’m going to have to stock up on a couple bottles of Krafty Gurls “Gloss It!”, which is currently on the Krafty Gurl website for $6.50 for a full-size bottle – a small price to pay to have your faith in topcoat restored. 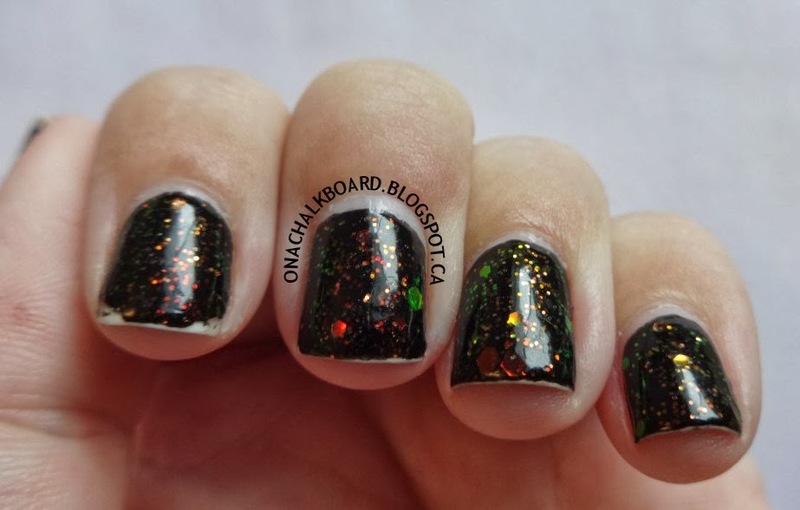 Krafty Gurl also makes fantastic-looking glitter topcoats, and nail art accessories.